Trustees have fiduciary duties to beneficiaries of trusts that they oversee. 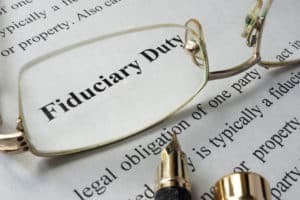 The duty to account and the duty to invest and manage trust assets prudently are two very important fiduciary duties that are difficult for many family member trustees to manage on their own without professional help. Trustees have the duty to invest and manage trust assets prudently. In Illinois and many other states, trustees must follow the Prudent Investor Rule: trust assets should be invested and managed as a prudent investor would. Trustees should consider the purposes, terms, distribution requirements, and other circumstances of the trust. They cannot consider one or two assets in isolation. Instead, they need to manage each investment with reasonable care, skill, and caution, in the context of the trust portfolio as a whole. Crucially, trustees should have an overall investment strategy that considers the portfolio’s various risks and rates of return. To consider both generating income and keeping capital safe in making investment decisions. The trustee’s duty to incur only reasonable and appropriate costs. If you are a family member trustee without investment or financial experience, you may need professional assistance to manage the trust. You should consider hiring a financial adviser and an accountant to help you. If you have not spoken to a lawyer about the trust, set up a consultation to learn more about your rights and responsibilities as a trustee.